In May, we introduced the Local Impact Fund for Transformation (LIFT). This fund is one way that we are celebrating and encouraging the involvement of our congregation as they serve in various local organizations that seek the flourishing of our communities. Since the church is essentially the people of God, wherever individuals go and serve, there goes the church. As our Hershey Free folks serve in the community, they carry the gospel and light of Christ with them. LIFT allows us to celebrate that and to encourage our congregation and the organizations that they support. 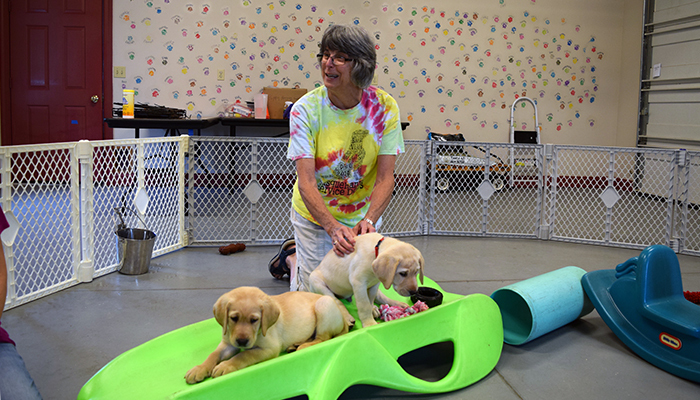 One recently awarded LIFT grant was requested by Nelda Wachtman for Susquehanna Service Dogs. This group raises, trains, and places service dogs to assist children and adults with disabilities so that they can become more independent. Nelda volunteers as a Public Trainer and helps with office work. She also helps with Team Training, which includes helping potential partners learn to work with their specifically matched dog. Many volunteer opportunities exist at Susquehanna Service Dogs. They would love to have you check them out. LIFT is a designated fund that operates outside of our general ministry budget. The only way that we can continue to impact our community and our congregation members through this fund is through the generous donations of our people. Thank you to those of you who have already given, and thank you in advance to those of you who resonate with the heart of this fund and will give as a way to further the difference that the individuals of Hershey Free Church are making in our area. To donate to LIFT, simply write “LIFT” on the memo line of your check or offering envelope; or give a donation online.